Dundlod is a prominent thikana of Shekhawati. 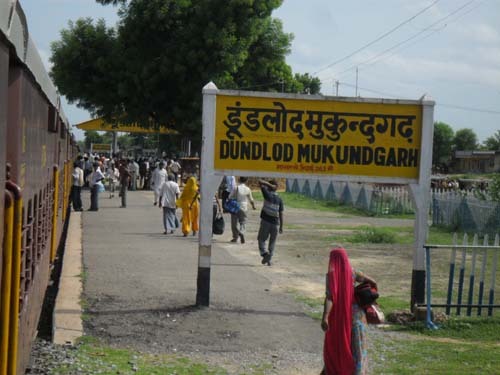 Dundlod is situated in Jhunjhunu district of Shekhawati region, the nearest towns are Nawalgarh and Mukundgarh. Dundlod was awarded to Thakur Keshri Singh the youngest son of Maharao Shardul Singh, the ruler of Jhunjhunu. Hence, Dundod is also a part of Panchpana. Sheo Singh Ji, a descendant of Thakur Keshri Singh was an admirer of art, hence he contributed a lot in making Dundlod a beautiful place. This town is an educational hub these days as many schools, research centers and private colleges have been set up. Shekhawati people send their wards to Dundlod for quality education and overall development. 1- Dundlod Fort: Built in the year 1750AD by Thakur Keshri Singh, the fort of Dundlod is a masterpiece of Rajput architecture. It is a grand building with beautified walls, ramparts and interiors. The main attractions are Suraj Pole, Bichla Darwaza, Diwan Khana, Duchhata & the roof top for a finest view of the town Dundlod. These days this fort is converted in to a heritage hotel and maintained by the Shekhawat Rajput erstwhile rulers. The fort was divided in to two main parts, the major one was Mardana (For the use Male Members of Noble family) and some area for Janana (For Female Members of Noble family). As there was Purdah custom in the Rajput families and even today most of them observes these old customs religiously. 2- Other than the Dundlod fort few Havelis (Mansions) with fresco paintings rich in spiritual depiction are there in the village. Goenka family of Dundlod has contributed in making some of havelis other wise most of them were erected by the Shekhawat Thakurs. The Chhatri (Cenotaph) of Seth Ram Datt Goenka is also a tourist attraction, it was built in 1888 and is enriched with devotional fresco pictures inside the dome. Bhagirath Mal Goenka Haveli , Lal Chand Goenka’s Haveli and Satyanarayan Temple were built by Goenkas. Dundlod is easily reachable by road from both Jaipur and Delhi. It is 250 KM from the national capital Delhi. The road route goes like: Delhi>Rewari>Narnaul>Chirawa>Jhunjhunu>Dundlod. The town is also approachable by rail, the nearest railway station is Mukundgarh on Loharu-Jaipur rail line. Loharu is directly connected to Delhi. By Air : The nearest Airports are at Delhi (Indira Gandhi International Airport) and Jaipur (Sanagner Airport). Dundlod is my birth place and memory of dundlod is always in my mind. wheather, I live there or not. I always miss my village.